Expand the proportion of US foreign assistance subject to MCC-type aid-effectiveness principles, while increasing the proportion of flexible funding that is not subject to congressional directives or administration initiatives. Further strengthen the implementation of key aspects of MCC’s model, such as the commitment to cost-effective investments, advancing transparency efforts, and learning from ongoing and completed programs. Pilot new approaches, such as outcome-based aid and regional compacts that address cross-border growth constraints. When the George W. Bush administration launched the Millennium Challenge Corporation (MCC) just over a decade ago, its vision was to make fundamental changes to how the US government delivered foreign assistance. MCC has a single mission — reducing poverty through economic growth — that allows it to pursue development objectives in a highly targeted way. The agency’s model for how it pursues that mission was, from the outset, grounded in fundamental principles of aid effectiveness. Its programs are driven by well-governed developing-country partners, with individual projects selected on the basis of expected economic returns. In addition, MCC has integrated robust monitoring and evaluation into its operations more than any other development agency in the world. That the US Congress, with bipartisan support, has protected MCC’s flexibility and responsiveness by keeping it free of spending directives has been a key factor enabling the agency to operationalize its groundbreaking model. Following MCC’s 10th anniversary last year, many policymakers and politicians are also looking closely at MCC itself and wondering what should be next for the agency. This juncture presents opportunities for innovation and adaptation; however, pressure to expand and evolve raises the risk of mission creep and watering down MCC’s model. To increase MCC’s effectiveness, as well as the way its principles are applied throughout the broader foreign assistance portfolio, the next US president should embrace MCC’s focused mission and results-oriented approach while directing his or her administration to advance several adjustments to further improve and expand its impact. MCC has struggled at times to preserve its focus on high-quality programs while trying to deliver large programs quickly. Consequently, any encouragement to expand MCC’s budget should explicitly caution against funding large investments whose expected returns are poor or unknown. In this brief, we review what makes MCC unique from other US development agencies and how it has performed during its first decade of operations. Following this, we identify a number of specific reform proposals. Policies matter. MCC partners only with relatively well-governed low- and lower-middle-income countries that demonstrate commitment to governing justly and democratically, investing in their people, and encouraging economic freedom. This reflects the premise that aid should build on and reward policies that promote private investment and poverty-reducing economic growth. Results matter. MCC’s robust results framework directs the agency to address binding constraints to growth, identify economically efficient projects (i.e., those with local benefits that exceed project costs), track the projects’ progress, and measure their impact. Although MCC has not always acted according to its results-based principles and has experienced disappointing results at times, even when it has implemented its own best practices, its framework remains exemplary within the development community. Locally developed and owned programs matter. MCC works in partnership with eligible countries to develop and implement agreed-upon programs. This assumes that US investments will be more effective and sustainable when they support local priorities and strengthen partner governments’ accountability to their citizens. MCC is not the only US government agency to incorporate aid-effectiveness practices into its operations. USAID, in particular, has pushed forward a number of reforms in recent years, including efforts to increase local ownership of foreign assistance projects, use economic analysis to inform project selection, and evaluate results. Even in this context, however, MCC remains at the forefront of applying best practices in foreign aid, doing so across its entire portfolio and throughout the lifespan of each program. This is something that no other US agency does currently. In fact, in the Center for Global Development and Brookings Institution’s 2014 Quality of Official Development Assistance (QuODA) assessment, MCC outperformed all other US aid agencies on the basis of how well they maximize efficiency, foster recipient countries’ institutions, and reduce administrative burdens on the partner country. To date, MCC has signed compacts (five-year grant programs) totaling roughly $10 billion with 25 countries (see table 1). In this section, we examine the three core pillars of MCC’s model, assess the agency’s track record of implementing those principles in practice, and discuss the potential for their extended application to other parts of the US foreign assistance apparatus. MCC partners only with relatively well-governed countries. Countries are picked largely (but not exclusively) on the basis of their performance on publicly available “scorecards.” These are compilations of quantitative policy indicators from reputable third-party organizations (e.g., the World Bank, Freedom House). MCC’s transparent, evidence-based selection process was intended to depoliticize eligibility decisions. The agency’s founders recognized that the allocation of most US development assistance funds tended to reflect both a need to support strategic allies and a need to have widespread recognized presence. MCC’s record of country selection suggests that policy performance has been the main criterion for eligibility over time. While US geopolitical interests have almost certainly influenced some decisions about compact eligibility, that factor has not generally trumped MCC’s overall focus on policy performance. That is, MCC has not, to date, selected any relatively poorly governed countries to receive its large compact agreements. Adherence to this principle should be continued in the future. MCC can also suspend or terminate a country partnership following a substantial deterioration in policy performance. In fact, the agency has halted eligibility or funding for more than one-third of its compact-eligible countries over the last decade. Undemocratic practices, such as military coups or irregular elections, have been the most common reason for suspension or termination decisions. A willingness to curtail partnerships with countries that experience policy declines should be continued as well. MCC is currently the only donor worldwide to use a largely transparent set of governance criteria to determine where it will work. Of course, this type of selective approach is not necessarily appropriate for all US government development efforts. For example, humanitarian relief, refugee assistance, and postconflict reconstruction tend to be concentrated in more fragile policy environments. However, for some portions of the foreign assistance budget, like those focused on economic growth goals, it may make sense for other US aid agencies to apply greater policy-based selectivity. Such an idea has been raised periodically (for instance, the PPD stressed that the United States should be more selective, and the 2015 Quadrennial Diplomacy and Development Review [QDDR] mentions partnering with countries committed to good governance), but broader implementation remains limited by a variety of factors, including congressional earmarks and broader US diplomatic interests. When MCC was founded, there was widespread skepticism regarding the effectiveness of foreign assistance. Many observers agreed that a lot of foreign aid was spent on poorly designed and implemented projects with weakly defined objectives or unclear linkages to the expected development results, if not both. There was little understanding of what aid dollars were achieving. In response to this concern, MCC was designed with a single objective — reducing poverty through economic growth — that in practice was understood as funding only projects with benefits in terms of local income increases that would exceed project costs. MCC developed a three-pronged results framework to measure, throughout the project lifecycle, results linked to this ultimate goal: (1) MCC requires country partners to use economic analysis to identify impediments to growth and to design projects that would achieve efficient economic return (i.e., their expected benefits would exceed project costs); (2) MCC and its country counterparts monitor the progress of intermediate results during implementation (were the interventions undertaken as planned with outcomes as expected? ); and (3) upon project completion, MCC uses independent evaluations to rigorously assess whether impact attributable to the project’s interventions occurred. This section looks at two of these components: economic return and evaluation. Although MCC invests in the same activities as other donors (e.g., building roads, training farmers), its distinguishing feature is its commitment to finance only those projects that are expected to raise local incomes by more than the cost of implementation. Although almost all aid projects generate some benefits, other donors are rarely able to determine whether the gains from their assistance justify the expenditure of limited aid resources. In contrast, MCC adopted the use of cost-benefit analysis to identify growth-focused projects (i.e., those with benefits that exceed their costs). Cost-benefit analysis compares all project costs with expected increases in local incomes over the lifetime of the project (usually 10 to 20 years). Relying on cost-benefit analyses to screen for program quality across the agency’s entire portfolio has set MCC apart from other donor organizations, including all other US agencies. USAID is currently expanding the use of cost-benefit analysis in its program design processes, but the share of the portfolio assessed for economic return remains relatively small. MCC has largely adhered to its guiding principle of selecting efficient economic investments. However, some notable exceptions suggest MCC could further strengthen the implementation of this commitment going forward. These inconsistencies typically have taken two forms: (1) approving projects whose costs exceed their benefits, or (2) deciding to fund projects without first conducting cost-benefit analyses. According to publicly available information, in MCC’s first 10 years, more than 90 percent of program funds went to projects estimated to achieve sufficient economic returns. However, approximately 9 percent of MCC’s portfolio — around $800 million — did not demonstrate acceptable returns at the time of project approval. 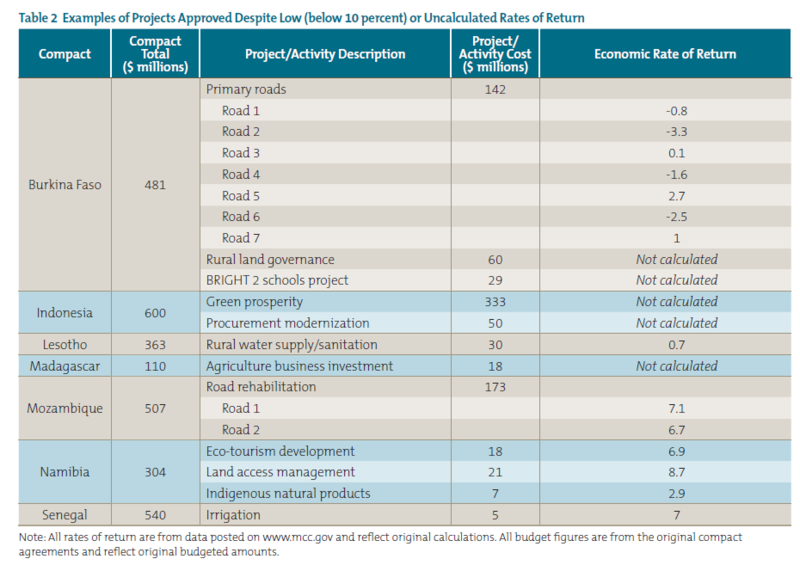 In some cases, the agency approved projects whose costs were known to exceed their benefits; in other cases, it approved projects in the absence of cost-benefit analysis, often on the grounds that the implementation strategy of the proposed activity was not yet sufficiently developed to estimate its effects (see table 2). In a few cases, MCC funded activities that were considered experimental, and therefore lacking in evidence of impact. While MCC clearly should have room to innovate, experimental activities should be a relatively small proportion of a country’s program funds, and they should be subject to rigorous evaluation. In contrast, more than 50 percent of the $600 million Indonesia compact was not subject to cost-benefit analysis, and many of those expenditures will not be amenable to rigorous impact evaluations. MCC was designed to make large high-return investments, not primarily as a tool for trying interventions whose impacts are unknown. Large expenditures on proposals with substandard returns or no solid basis for estimating impact are inconsistent with the agency’s focus on generating efficient results; that is, generating benefits that justify the costs of achieving them. Several factors likely explain these project approval decisions. For instance, partner governments may have applied pressure to pursue politically valuable projects, and US and international advocacy organizations sometimes press for sector-specific spending. In addition, there can be internal pressure within MCC to deliver compacts within a predetermined time frame or of a specific financial size. This can result in the inclusion of activities justified more for their political expediency or their role in minimizing unobligated balances than for their economic logic. To MCC’s credit, its commitment to transparency enables stakeholders to recognize and question the agency’s choices to invest in projects that will not raise incomes in an efficient manner. However, while all initial investment decisions are subject to public scrutiny, MCC has not extended the same level of transparency to decisions about midcourse changes in implementation plans, weakening the agency’s accountability. MCC has received well-deserved accolades for its commitment to conducting and publishing high-quality evaluations for the majority of its projects. Other US government foreign assistance agencies, notably USAID, have also increased their focus on evaluation for purposes of learning and accountability. But MCC remains a leader, evaluating far more of its portfolio, more systematically applying the evaluation process, using more rigorous methods, and more clearly communicating evaluation results. During the next presidential administration, MCC should continue to strengthen its evaluation practice, with a focus on increasingly transparent and frank discussion of results, regardless of whether the desired impact has been achieved or not. While MCC remains a leader, it still has substantial room to improve the timeliness and transparency with which it communicates the results of its evaluations. The idea of country ownership reflects the understanding that partner-country governments, in consultation with key stakeholders, should lead the development and implementation of their own national strategies. Donor governments worldwide have repeatedly endorsed this principle for more than a decade. Among US development agencies, MCC’s approach is arguably the most comprehensive given its multiyear funding and lack of congressional spending directives. This provides the agency far more flexibility to support country-led priorities than other US agencies with structural constraints that prevent greater action in this area. For instance, extensive congressional spending directives, some imposed at the behest of the agency itself, as well as a range of presidential initiatives, require that USAID spend funds on priorities identified inside the DC Beltway rather than on those identified by its partner countries. MCC has funded country-identified priorities across a range of sectors, and it is clear that the agency’s flexibility to do so has enabled it to fill some important gaps. For example, when MCC was created, transportation infrastructure suffered from a dearth of donor funding. That area quickly became MCC’s most funded sector, reflecting the agency’s ability to address countries’ needs in an area where other donors were unable or unwilling. Energy has recently emerged as a key country-led priority among a number of MCC’s partners, consistent with the US government’s focus on tackling this constraint through its Power Africa initiative (see the White House and the World paper “Powering Up US Policy to Promote Energy Access.” However, in keeping with its principle of country ownership, MCC must be careful that its energy investments are driven by evidence that power is a main constraint to growth in a partner country and that the partner, not just the White House, prioritizes this focus. MCC’s approach to local ownership is integrated throughout the compact process. Partner governments — in consultation with citizens, nongovernmental organizations, and businesses — are responsible for proposing funding priorities. They also lead compact implementation. However, the principle of local ownership is complicated, and incorporating it well often requires a fine balancing act with other requirements such as the need for accountable use of funds, the need to ensure expedient implementation, and the need for proposed projects to meet MCC’s parameters for economic return. MCC is also occasionally challenged by having to weigh domestic pressures from US stakeholders against country priorities. 1 Expand the proportion of US foreign assistance subject to MCC-type aid-effectiveness principles. Many aspects of MCC’s model, as referenced above, should be applied to more of the foreign assistance budget. This could be achieved in part through increased funding for MCC. However, more money should be contingent upon the agency’s identification of results-focused investments in eligible countries that justify the expenditures. However, greater impact would likely come from continuing to expand the use of results-focused aid-effectiveness practices within the other US aid agencies, especially USAID and the State Department, which together control three-quarters of US foreign assistance dollars. In particular, the next presidential administration should require that these agencies — for far more of their portfolio — clearly demonstrate value for money, apply greater country selectivity, give partner countries more responsibility for identifying and managing aid investments, and further their commitment to transparency and rigorous evaluation. (This proposal should be read in conjunction with the White House and the World paper “Making USAID Fit for Purpose — A Proposal for a Top-to-Bottom Program Review.” MCC’s set of standard practices is not necessarily systematically appropriate for all US foreign assistance objectives and programs. Some things, such as expanding the use of constraints analysis, a commitment made in the 2015 QDDR, are more relevant for growth-focused programming. However, other aspects, such as cost-benefit analysis, country participation, evaluation, and transparency, can be applied more broadly and across sectors and initiatives. The lack of congressional spending directives is a key feature that enables MCC to implement its model. The flexibility to support partner-country priorities and target results-focused investments, with appropriate oversight and quality controls, should be preserved. It should also be expanded throughout the US foreign assistance budget. In practical terms, this will require working with Congress to prevent burdensome directives as well as reducing executive branch requests for specific priorities. The next administration should also moderate the use of presidential initiatives since they, too, can constrain agencies’ ability to respond to local priorities. 3 Further strengthen the implementation of key aspects of MCC’s model. MCC should continue to reinforce its commitment to pursuing only investments with adequate economic returns, in both the initial project approval stage and during midcourse corrections. It should refrain from financing investments whose benefits are either unknown or known to be less than their cost, and it should increase accountability for such decisions by publicly disclosing the data that informs midcourse corrections. In addition, the next administration will bear significant responsibility for managing and messaging the results achieved with MCC funding since many evaluations will be finalized over the next several years. MCC should build on its proven leadership in evaluation practices by reinforcing its commitment to publishing all evaluation reports, increasing resources dedicated to timely dissemination of results, and demonstrating how it is applying lessons to its ongoing programs. 4 Pilot new approaches to expand MCC’s impact. The next administration should encourage MCC to expand its impact while ensuring that any innovations remain closely aligned with the agency’s core founding principles. In particular, the next president should encourage MCC to continue current efforts to experiment with regionally based programs that address eligible countries’ binding constraints to growth and poverty reduction. This will present a number of practical challenges for MCC’s existing model that must be handled carefully. Nevertheless, the next presidential administration should continue to work closely with Congress to secure authority to pilot regional MCC compacts in contiguous eligible countries, assess the successes and challenges of early attempts, and then consider whether the practice should be institutionalized going forward. The next US president also should encourage MCC to pilot pay-for-performance approaches, such as Cash on Delivery Aid. These are agreements in which donor agencies pay a partner country for the delivery of independently verified and measurable pre-agreed outcomes. (This proposal should be read in conjunction with the White House and the World paper “Shifting the Foreign Aid Paradigm — Paying for Outcomes.”) Pay-for-performance schemes fit well with many aspects of MCC’s model, and the agency has already signaled its interest in pursuing them. They are focused on measuring results and promote greater country ownership by providing partner governments with increased flexibility to find the best ways, within their own local context, to achieve agreed-upon targets. Over the past decade, MCC has firmly established itself as a global leader in changing how aid is delivered. Strong bipartisan support — spanning the Bush and Obama administrations, as well as within the US Congress — has been critical to its achievements and to maintaining the integrity of its guiding principles. The next US president should embrace MCC’s strong track record while overseeing further improvements to its model. This includes careful piloting of new approaches that reflect emerging demands, such as regionally based and pay-for-performance programs. However, the largest prize ultimately will entail continuing to expand more of the aid-effectiveness practices that MCC embraces to cover more of the US aid portfolio. Development Impact Bond Working Group. Investing in Social Outcomes: Development Impact Bonds. Washington: Center for Global Development and: Social Finance, 2013. Sarah Rose. “Regional and Sub-National Compact Considerations for the Millennium Challenge Corporation.” MCC Monitor analysis. Washington: Center for Global Development, 2014. Sarah Rose. “Subsequent Compacts Are the Future of the Millennium Challenge Corporation.” MCC Monitor analysis. Washington: Center for Global Development, 2014. Sarah Rose and Franck Wiebe. “MCC at 10: Focus on Country Ownership.” MCC Monitor analysis. Washington: Center for Global Development, 2015. Sarah Rose and Franck Wiebe. “MCC at 10: Focus on Policy Performance.” MCC Monitor analysis. Washington: Center for Global Development, 2015. Sarah Rose and Franck Wiebe. “MCC at 10: Focus on Results.” MCC Monitor analysis. Washington: Center for Global Development, 2015. Sarah Rose and Franck Wiebe. “An Overview of the Millennium Challenge Corporation.” MCC Monitor analysis. Washington: Center for Global Development, 2015. Although the World Bank evaluates virtually all of its projects, such assessments by the World Bank project lead at the time of project completion are rarely rigorous impact evaluations. Although the World Bank produces in absolute number the most rigorous impact evaluations of any development institution, the share of its portfolio subject to impact evaluation is still relatively small (despite having grown in recent years). For instance, 8 percent of World Bank lending operations approved between FY2005 and FY2010 and 10 percent of projects approved between FY2007 and FY2010 were linked to an impact evaluation. World Bank, World Bank Group Impact Evaluations: Relevance and Effectiveness (Washington: World Bank, 2012). By contrast, MCC conducts impact evaluations for more than 40 percent of its portfolio (by value). According to US Overseas Loans and Grants (http://gbk.eads.usaidallnet.gov/data/fast-facts.html), MCC was responsible for just under 5 percent of US economic assistance disbursements in FY2012. In comparison, USAID was responsible for 35 percent and the State Department 38 percent. Only two countries have ever been newly selected for compact eligibility despite not passing the scorecard criteria: Georgia (twice) and Mozambique (once). The vast majority (93 percent) of compact-eligible countries passed the scorecard at the time they were first selected; more frequently, countries once selected have been reselected despite failing the criteria while program development or implementation had commenced. The indicators on the scorecards are only proxies for policy performance, however, and in the cases of Georgia and Mozambique, the decision to select the countries despite their failing to meet the formal eligibility criteria had some plausible basis in supplementary data. Geopolitical interests have arguably been more visible in some eligibility decisions for the smaller-threshold program, a program intended to help countries become compact eligible, whose criteria for eligibility is less precisely defined. For examples, see Sarah Rose and Franck Wiebe, “MCC at 10: Focus on Policy Performance,” MCC Monitor analysis (Washington: Center for Global Development, 2015). 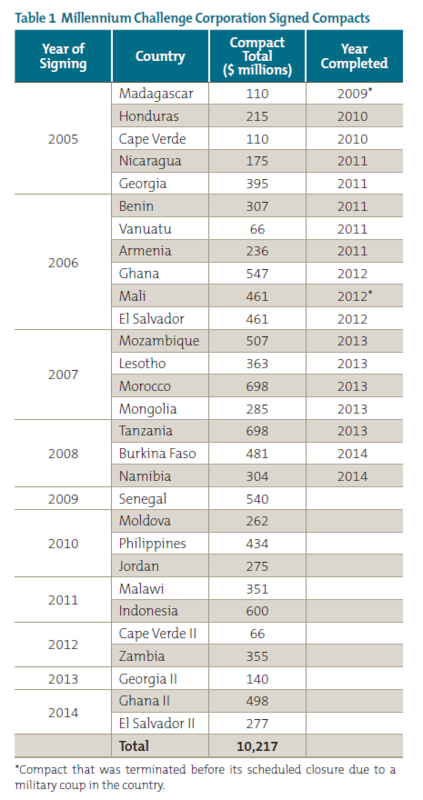 MCC cut funding or eligibility for 13 of the 35 countries selected for MCC compact agreements between FY2004 and FY2014. The World Bank’s International Development Association (IDA) also uses a publicly available set of quantitative policy criteria to inform resource allocation. However, all countries with per capita incomes below a certain threshold (plus some additional countries) get some IDA resources regardless of their policy performance. Countries that perform better on the policy criteria get a larger allocation. In contrast, MCC only funds countries that demonstrate a certain level of performance on its policy criteria. The Partnership for Growth, an interagency US government initiative that seeks to accelerate economic growth in select countries, used policy performance — including MCC scorecard performance — as part of its criteria to identify focus countries. MCC requires that projects have an expected economic rate of return (the interest rate at which the net benefits would equal zero) of at least 10 percent to be considered economically justified; this approach is consistent with approving only those proposed investments with a positive net present value using a 10 percent discount rate. Both USAID and the World Bank use cost-benefit analysis (CBA) today and have used the framework more extensively in the past. Both institutions have had reasons for reducing the use of CBA, including the increasing importance of nongrowth activities in their portfolios (e.g., democracy and governance at USAID, social welfare at the World Bank). Both institutions have also experienced the difficulty of preserving the credibility of CBA in the context of incentives to move money. (For an excellent description of the World Bank’s past and current practices, see Andrew Warner, Cost-Benefit Analysis in World Bank Projects (Washington: World Bank, 2010.) In many other development institutions, there is little formal effort to compare the cost of their operations to the value of their impact. These estimates were derived by compiling all the economic rate of return (ERR) calculations MCC has posted on its website plus references to original ERR values included in online monitoring and evaluation (M&E) reports. However, it is not clear whether all completed ERRs are posted online and/or referenced in M&E reports. The fact that M&E reports sometimes refer to ERRs that are not posted suggests that the public set of information is incomplete. It is therefore possible that nonpublic ERRs exist for some projects or activities; in which case, the estimate of the value of projects that do not demonstrate economic efficiency could be either higher or lower than cited here. Moreover, some projects with acceptable overall ERRs may have included substantial activities or subactivities that, if assessed independently, would not have demonstrated a sufficient rate of return, thus undercounting the dollars spent on investments that are not economically sound. Although pressure from US-based advocacy groups is not common, MCC did face high-level pressure from members of Congress and other US environmental groups to ensure that the Indonesia compact included substantial funding for activities aimed at preventing deforestation. MCC plans to spend $1 billion (of the approximately $7 billion pledged by the US government) to support Power Africa objectives in three countries: Ghana, Liberia, and Tanzania. For instance, as noted above, the expressed preferences of certain US stakeholders for the Indonesia compact to contain environmental programming contributed to the inclusion of a large project that was not among the Government of Indonesia’s top priorities. In addition, with MCC expected to play an important role in the Obama administration’s Power Africa initiative, there is the distinct possibility that the US government’s desire to finance power projects in designated countries influences partner countries’ decisions to propose projects in this sector over other potential areas they might otherwise prioritize. As noted earlier, according to US Overseas Loans and Grants (2014), MCC was responsible for 5 percent of FY2012 economic assistance disbursements. In comparison, the State Department and USAID were responsible for 38 percent and 35 percent, respectively. The 2015 QDDR also committed to expand data transparency and evaluation efforts. In addition, a substantial portion of the US foreign assistance budget is intended for nondevelopment objectives like humanitarian relief and support for geo-strategic allies. These are important and worthwhile goals for the US government to pursue, but the loss of focus that occurs when these objectives are muddled together with poverty reduction objectives can hinder the effective delivery of development outcomes.